I can’t think of a better way to get ready for the warm days ahead by loading up my to-watch list with a few good family movies about summer! There’s something about a summer movie that makes me reminisce about my own days of adventure and excitement. You just never knew where the day would take you. Movies that take place during the summer just have a different feel to them, don’t they? The days are longer, the adventures greater and the flow of the plot isn’t broken up by things like homework and bells ringing for class. Check out a few of our favorite good family movies about summer that you should not miss! 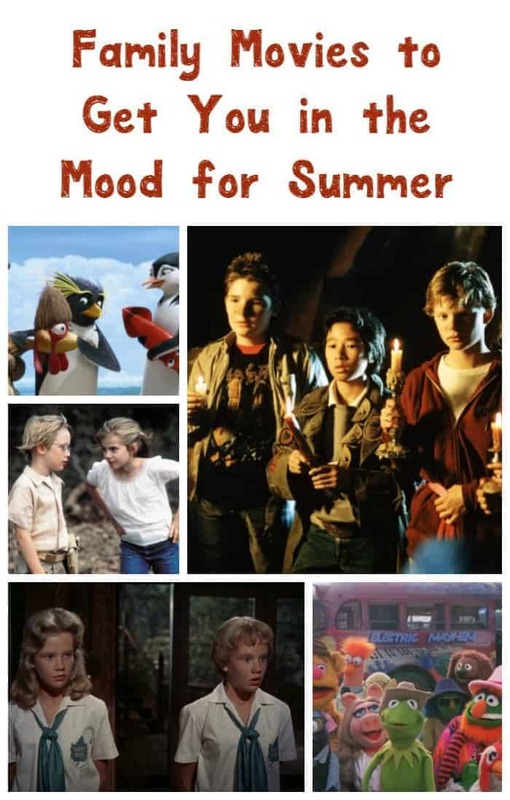 Do you have any favorite family movies about summer? Tell me about them in the comments! You have two versions to choose from here, but we’re talking about the original! The Parent Trap is a 1961 family comedy movie that is based on the 1949 novel titled Lottie and Lisa by author Erich Kastner. The film stars Brian Keith, Maureen O’Hara and Hayley Mills. The Parent Trap tells the story of identical twin sisters, Sharon and Susan, who each went to live with one of their parents shortly after they were born. Neither sister knew about the other until meeting at summer camp. The sisters devise a plan to reunite their parents; they are going to switch places with one another. If your kids aren’t feeling the 1960’s vibe of the original, you can also opt for the 1998 Lindsey Lohan version. The Muppet Movie is a 1979 musical comedy movie, featuring Kermit the Frog, who starts out on a trip cross-country from Florida, to pursue a Hollywood career. Along the way to Hollywood, Kermit picks up some of his Muppet friends like Miss Piggy, Fozzie Bear, and Gonzo. However, they also encounter a problem when it is discovered that a frog leg restaurant entrepreneur wants his hands on Kermit. The movie features Jim Henson, who voices the character of Kermit the Frog, Frank Oz, who voices the characters of Miss Piggy and Fozzie Bear and Dave Goelz, who voices the character of Gonzo. Surf’s Up is a 2007 computer animated family comedy movie that parodies several documentaries about surfing, including The Endless Summer, Riding Giants and North Shore. The film is made to look like a documentary, featuring behind the scenes adventures of the Penguin World Surfing Championship. The movie focuses on Cody Maverick, a Royal Penguin, as he leaves his home and family in Antarctica, to take part in the Big Z Memorial Surf Off on Pen Gu Island. Cody befriends a rooster buddy named Chicken Joe, trains for the competition with Big Z and falls in love with Gentoo Penguin named Lani. The movie features the voice cast of Shia LaBeouf, Jeff Bridges, Jon Heder, Zooey Deschanel, James Woods, Mario Cantone and Diedrich Bader. Fill up the rest of your movie list with these great family movies about summer! Independence Day- a great one to watch over the 4th of July, especially if your family loves action/adventure movies! Watching family movies about summer together is a great way to bond as a family and get excited about the warmer days that await us ahead! Who knows, you might even find inspiration for your summer adventures! Aww, these are some of my favorites! I miss the Goonies and My Girl! This is a great collection of movies. Some of our favorites are on there. Although I am not a fan of Muppets, my kids seem to love it! Thanks for the list. Aww, so many good movies. I loved Parent Trap when I was a kid. That was a favorite of mine. These are great movies. I grew up watching the Muppet Movie. My kids love it as well. I love The Parent Trap. That is one of my all time favorites for summer. It’s such a great movie. I remember when it first came out when I was younger. I still enjoy watching it. You chose a great selection for movies to think about Summer season for sure. I will have to try to watch some of these. I see some childhood fav’s on that list. We love watching movies as a family. Independence day is a must for us every summer. I don’t think there’s been a single July forth since its release that I didn’t watch it. What a walk down memory lane. Some of these are my favorites as well. I loved the original Parent Trap. I totally forgot about the old Parent Trap! I forsee a movie night in my future! These are great summer movies!! I have not seen some of these with my oldest I bet she will love Parent Trap and Goonies! I love the Parent Trap! Both versions are good, which rarely seems to happen with movies and remakes. The Goonies is one of the best movies ever! I’ve seen it, I don’t know… AT LEAST 20 times. I think one of my favorite summer movies is “What about Bob”. I really just love summer evenings with the windows open relaxing with family on the couch and watching just about anything. What a great list of movies. The old Parent Trap is awesome.